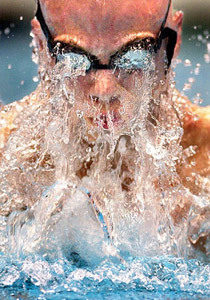 The 5th Annual Sports Shooter Contest, judged on February 7, 2003, had a record 2,569 images entered by 523 photographers from around the world. The judging panel of Peter Read Miller (Sports Illustrated), Deanne Fitzmaurice (San Francisco Chronicle), Brad Mangin (Bay Area freelance photographer), Ronal Taniwaki (Nikon Professional Services branch manager) and Robert Hanashiro (USA TODAY), took nearly 8 hours to decide the winners in 5 categories and select a "Picture of the Year" (best entry). The finals of the judging was open to spectators for the first time and attracted two dozen students, aspiring sports shooters and pros. The contest was made possible by donations from the following people and companies: Nikon (Ronal Taniwaki), Lowepro (John Riley), Canon (Dave Metz), AquaTech (Craig Rossignol), Versa-Flex (Larry Nolan), Roberts Distributors (Jody Grober), Lightware (Paul Peregrine), LPA Designs (Tim Neiley and James Clark), Penn Camera & Mamiya (Jeff Snyder), Rich Clarkson & Associates and Samy's Camera (Louis Feldman). Special thanks to Nikon for hosting the judging in their Torrance, California, office. 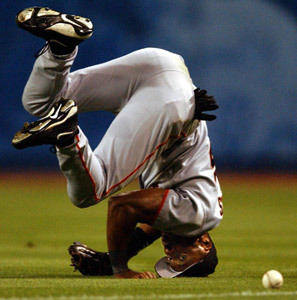 San Francisco Giants rightfielder Reggie Sanders, 16, goes head over heals and can't catch this Mark Grudzielanek drives that turned into a double that started a six run inning September 19,2002. Awarded: Nikon CoolPix 5000 and SB50, donated by Nikon. 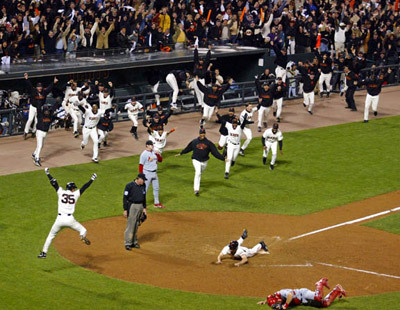 San Francisco Giants' David Bell goes sliding across home plate to score the winning run as the Giants defeat the St. Louis Cardinals to capture the National League pennant in San Francisco, Oct. 14, 2002. Awarded: Canon Powershot G3 digital camera with a CP 100 compact thermal printer, donated by Canon. 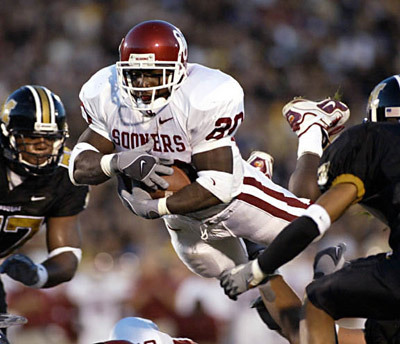 Oklahoma running back Kejuan Jones dives into the endzone to score Oklahoma's first touchdown in their game against Missouri. Oklahoma pulled off a fake field goal to win the game 34-24. Awarded: Lowepro Trekker, donated by Roberts Distributors. 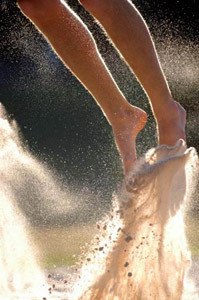 Lee Zahner takes off to block a ball during the 2002 Australian Beach Volleyball Series. Awarded: AquaTech Sports Shield, donated by AquaTech. Cory Bogaard competes for the state breast stroke championship. Bogaard finished second. Awarded: Versa-Flex laptop-Camera Case, donated by Versa-Flex. Boise High's Katie Ball, left, and Bishop Kelly's Ashley Cefalo collide as they battle for possession of the ball during their game Monday Sept. 10, 2002 in Boise, Idaho. Awarded: Canon 8x25 IS binoculars, donated by Canon. David Rochon, 20, of Palm Beach Gardens, FL., wipeouts on a large wave produced by Tropical Storm Cristobal near Jupiter Inlet. Awarded: Lightware Computer/Camera Bag, donated by Lightware. Tiger Woods acknowledging the gallery's cheers after winning the US Open golf tournament. Awarded: Pocket Wizard, donated by LPA Designs/Mamiya. J.T. 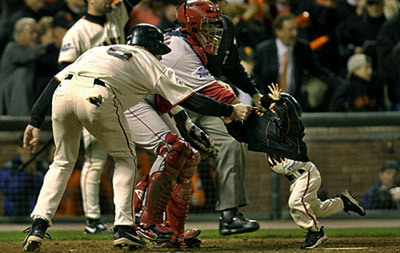 Snow grabs batboy Darren Baker to get him out of the way of a play at the plate during Game 5 of the World Series. Awarded: Lowepro Pro Roller, donated by Lowepro. University of Oregon football running back Onterrio Smith can't bear to watch as time runs out on his college career. Expectations of a Heisman trophy ended as Smith spent the final two games of the season on the bench with an injured knee. 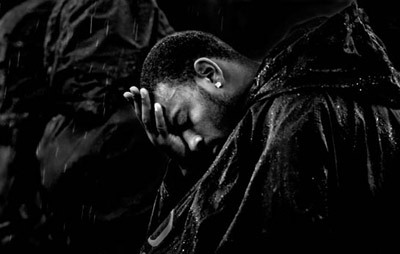 Awarded: Photographers Parka, donated by Roberts Distributors.